Pristine restoration of your space. Some messes require additional level of care. When it comes to assuring your commercial space is the safest and hygienic it can be, decontamination services may be a requirement for your space after a one-time event, or as part of regular cleaning maintenance. Whether it's medical facilities, industrial areas, or research settings, decontamination cannot be compromised for both your customers and your workers interacting in the space every day. Our Ozone Decontamination treatment does not simply cover up bad odor: it eliminates the source of the bad odor at the microbial level. Ozone sanitizes by breaking down microorganisms and other pollutants at their source. Ozone (O3) is able to get into the smallest spaces, which means that dust mites, cockroaches, pollen, molds, pet dander, rodents and other substances that cause or trigger allergies can be eradicated through any opening. It is naturally created from normal oxygen (often during thunderstorms or from sunlight), but Smith Restoration uses industrial biotech equipment to harness that power in a controlled environment. The treatment typically takes between 2 to 6 hours, after which the ozone reverts to oxygen about an hour after the equipment is turned off. This leaves the air fresh and clean because the source of the odor has been permanently removed, down to the micro level. This service can be provided in both residential and vehicle environments: oftentimes in houses or apartments, and camper vehicles or cars. Smith Restoration uses Ozone Generators for industrial and medical applications, following strict manufacturing settings standards. Additionally, we replace the necessary ceramic plate of the equipment after every use to reduce risk of cross-contamination. Rodents and related removable parts, such as nests, dead rodents, bugs, etc. As ozone can be harmful to your health, it should be noted that all living things (including pets and plants) will need to be removed during the time of the decontamination treatment. Ozone should not be inhaled, as it can cause damage to lungs, shortness of breath, and throat irritation. For long term treatment, it is recommended that a window be kept slightly open to provide a constant source of oxygen to the unit for ozone creation. After the use of the Ozone Generator, the "residual" ozone will reduce back to oxygen, and the space is safe for inhabitation again. Smith Restoration has additional capabilities to undertake construction needs like roof or building repairs to eliminate the source of the contamination. Various methods and practices exist in the decontamination business to clean and sterilize facilities. Smith Restoration & Waterproofing conducts our decontamination services using technology based of primarily chlorine dioxide solution. Use of chlorine dioxide in its gaseous form can reach all corners of the room as it dissipates, resulting in even cracks and corners receiving high levels of decontamination-- something not always achieved with simple wipe-down or vapor-based deep cleanings alone. Additionally, the gas can get on, underneath, or between all surfaces, so no small section is overlooked. 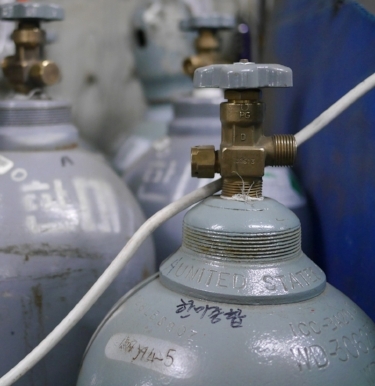 Benefits of chlorine dioxide gas include an overall ease of use for our technicians, reduced costs, and the quicker use of a technique that is unaffected by outside factors. For most spaces, the decontamination process can be completed on the day in a matter of hours. Chlorine dioxide is a non-carcinogenic, EPA-certified sterilant that is effective against viral and bacterial growths and germs. Since it is a colored gas, chlorine dioxide can be monitored effectively both visually and through measuring instruments, ensuring the process is controlled by our experienced decontamination professionals. The safest component of gaseous chlorine dioxide decontamination is that it removes a person from the process. Removing a person from the active decontamination process avoids potential safety hazards, and lets us carefully monitor the progress. In a gaseous form, it fills the volume of the space it is in and provides complete coverage evenly throughout the room. It is also is unaffected by weather or temperature conditions like heat or condensation. Plus, the solution is safe to use on properly-coated materials and won't leave residue marks after treatment. The space's HVAC system must be properly functioning to make sure the gas can be exhausted out of the space. All the electrical outlets and switches must be covered to ensure chlorine dioxide gas does not escape, as well as ductwork and any other external-facing vents. Moisture is required to process the gas within the decontaminated space, so humidity is increased to introduce the gas in its correct concentration. Fans, humidifiers, or nebulizers may also help distribute the gas throughout the room. After the space is fully prepared for decontamination and the correct measuring instruments are set up, the room is then sealed. The gas is let into the space for a predetermined amount of time to effectively clean the space. This is referred to as the "charge" phase, where the chlorine dioxide is let out to reach its set concentration. The gas's concentration is monitored throughout its exposure to the space, and may be adjusted accordingly throughout decontamination. The decontamination process ends by removing the chlorine dioxide solution with aeration, or flushing the room with clean filtered air. Additional supplemental methods may be used to assist in the decontamination process, such as manual wiping methods to get a physical touch to the cleaning process after the chlorine dioxide gas has been applied. In Need of Decontamination Services? Please contact Smith Restoration & Waterproofing to schedule your decontamination service, or if you have any additional questions about our services.